Endometrial Biopsy Cannulae Market - Size, Share, Outlook, and Opportunity Analysis, 2018 - 2026 Endometrial Biopsy Cannulae Market by Product Type (Rigid Endometrial Biopsy Cannulae and Flexible Endometrial Biopsy Cannulae), by End User (Hospitals, Diagnostic Centers, Specialty Clinics, and Others) and by Region - Size, Share, Outlook and Opportunity Analysis, 2018 – 2026 An endometrial biopsy is a procedure used for obtaining small and thin section of endometrial tissue, an inner most lining of uterus, for disease detection and testing. Clinically endometrial biopsy cannulae is used for the evaluation of infertility, amenorrhea, uterine cancer, abnormal uterine bleeding or endometrial infection. Endometrial biopsy cannulae are available in varying size. They are effective and affordable small medical device used for regular diagnostic practice. Disease detection based on biopsy is gaining significant traction, owing to its accuracy, which is expected to drivie the endometrial biopsy cannulae market growth over the forecast period. For instance, according to National Cancer Institute, around 85% of endometrial cancer are diagnosed at earlier stage using endometrial sampling or biopsy. Moreover, increasing incidences of uterine related diseases are driving growth of the endometrial biopsy cannulae market. 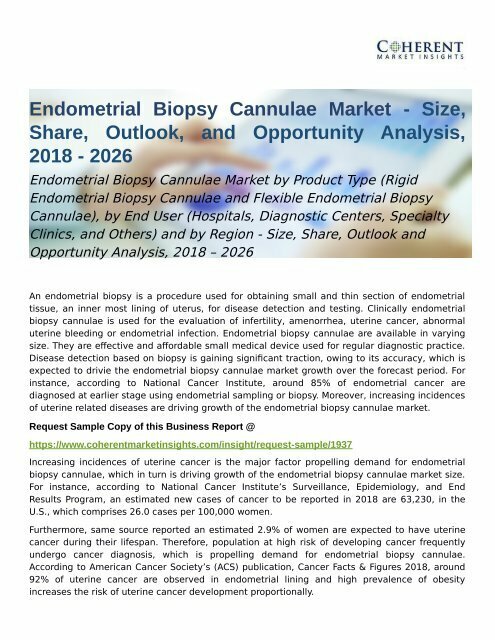 Request Sample Copy of this Business Report @ https://www.coherentmarketinsights.com/insight/request-sample/1937 Increasing incidences of uterine cancer is the major factor propelling demand for endometrial biopsy cannulae, which in turn is driving growth of the endometrial biopsy cannulae market size. For instance, according to National Cancer Institute’s Surveillance, Epidemiology, and End Results Program, an estimated new cases of cancer to be reported in 2018 are 63,230, in the U.S., which comprises 26.0 cases per 100,000 women. Furthermore, same source reported an estimated 2.9% of women are expected to have uterine cancer during their lifespan. Therefore, population at high risk of developing cancer frequently undergo cancer diagnosis, which is propelling demand for endometrial biopsy cannulae. According to American Cancer Society’s (ACS) publication, Cancer Facts & Figures 2018, around 92% of uterine cancer are observed in endometrial lining and high prevalence of obesity increases the risk of uterine cancer development proportionally.